In the 13th Jiaqing year (1808) of the Qing period, the scholar official Yan Ruyi (严如熤, 1759~1826) was appointed as Hanzhong Zhifu (Prefect). While he was in Hangzhong, Yan Ruyi made many contributions to the development of local educational institutions and cultural activities. He also managed the production of the “Hanzhong Gazetteer” (Yan and Zheng, 1813; 严如熤,《漢中續修府志》) and was engaged, also with the help and support of Zheng Bingran, in a much more extensive mapping activity of the Qinling and other regions of Shaanxi, Sichuan, Hubei and Gansu that reached its conclusions at the beginning of the reign peiod of the Daoguang Emperor in 1822. These efforts were all responses to the desire of the Qing government to gather information to help provide greater security throughout the wild border region of the four Provinces. Some early outcomes of this extended period of mapping were the map called “Map of the four provinces in the north bank of the Han River” of which a copy is available from the US Library of Congress collection and the later “Complete overview of defence conditions in three provinces” (Yan Ruyi, 1822). 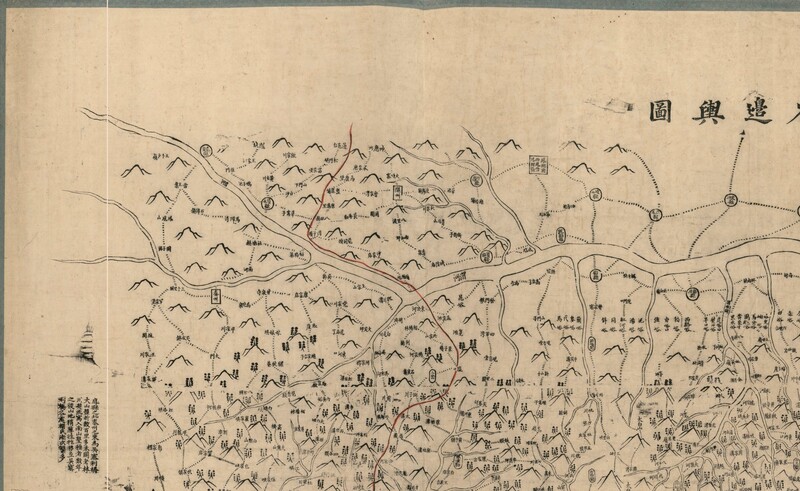 The maps produced by Yan Ruyi for the “Hanzhong 1813 Gazetteer”, the “Map of the Four Provinces …” and for the later “Complete overview of defence conditions…” are the subject of this page. 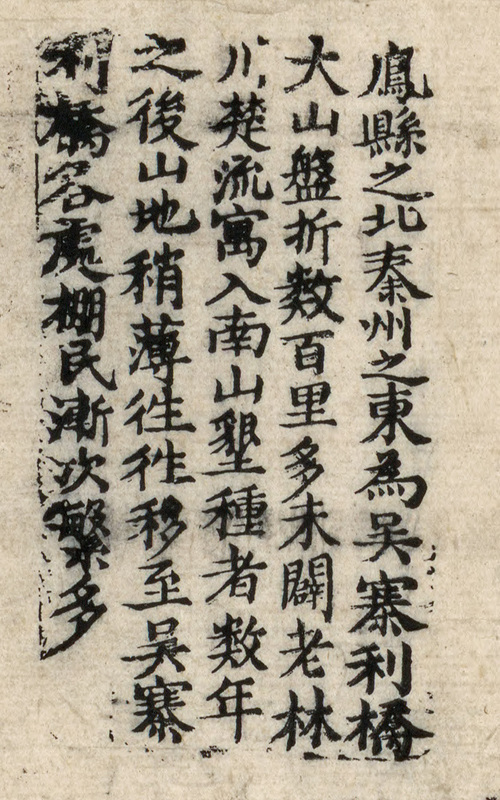 Yan, Ruyi (1822). Complete overview of defence conditions in three provinces, 14 Chapters. (In Chinese). 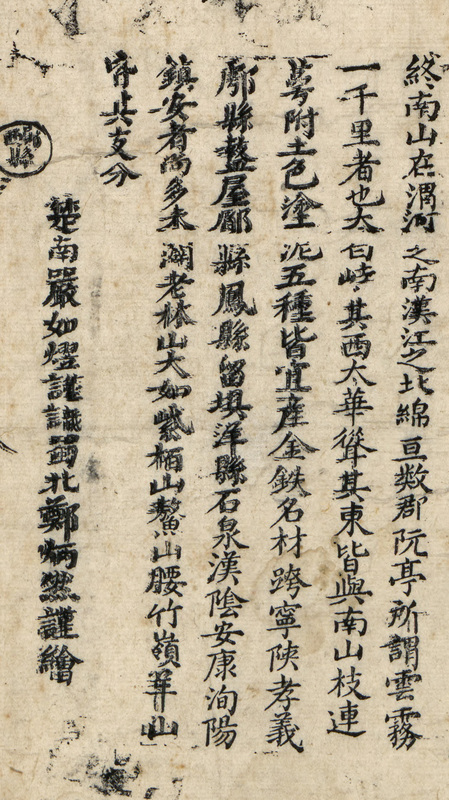 The US Library of Congress has a large collection of old and ancient Chinese materials. Among these are maps and map reproductions dating back some centuries. The Geography and Map Division of the Library web page can be found HERE. 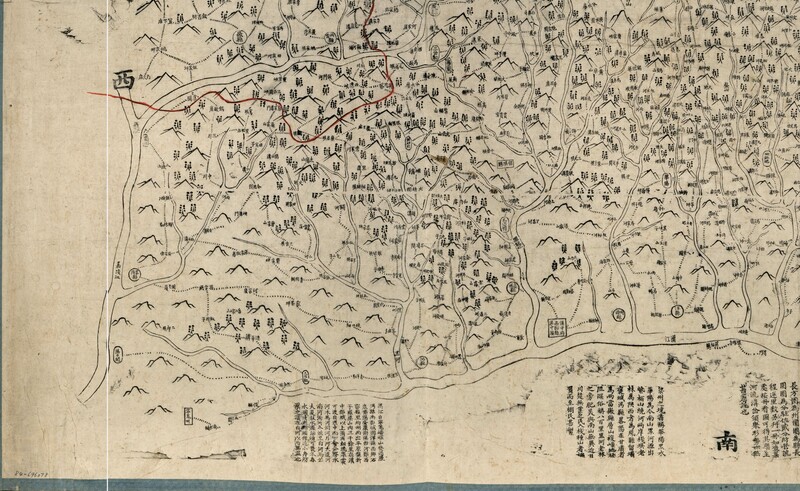 Part of the collection is the Arthur Hummel collection and some of the maps of the Hummel collection are among the 373 Chinese images available in digital format. The Chinese Maps that are available can be accessed directly HERE. Images can be downloaded for use in research and other non-profit activities in GIF, JP2 (JPEG 2000), or JPEG formats. However, only the JP2 format file has the resolution that allows view of all readable characters at the brush stroke detail level. For academic study, high resolution view of characters is therefore essential. If you wish to download and view the detail in these maps you will need suitable software to read JPEG 2000 and view the data. Possibly the best software available for this is IrfanView that can be downloaded from HERE. The Library of Congress collection has previously been the souce for important material used in our work on the Qinling Shu Roads web site. 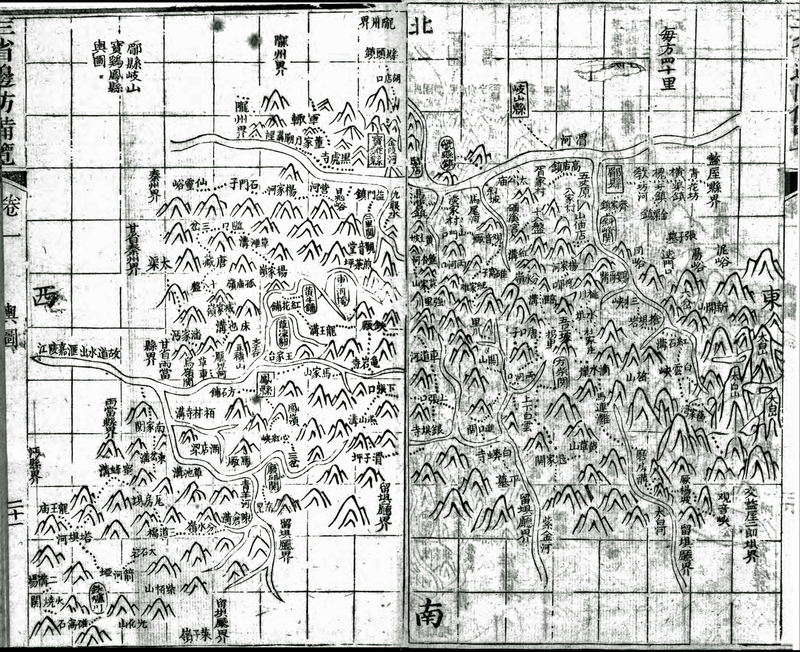 The project investigated a Qing Period strip map of the northern Plank Road and provided translations of Chinese papers describing its history and significance. At the time, the online maps were not available and it was scanned for the researchers into a set of Tiff files and reduced by the authors to Jpeg images of sufficient resolution to read the characters. This project area, which was instigated due to their previous study by Herold J. Wiens in 1949 can be found HERE. At this time the complete set of sections making up this strip map are NOT yet available as Jpeg2000 images and the set available at this web site are at the best resolution that can be widely accessed. 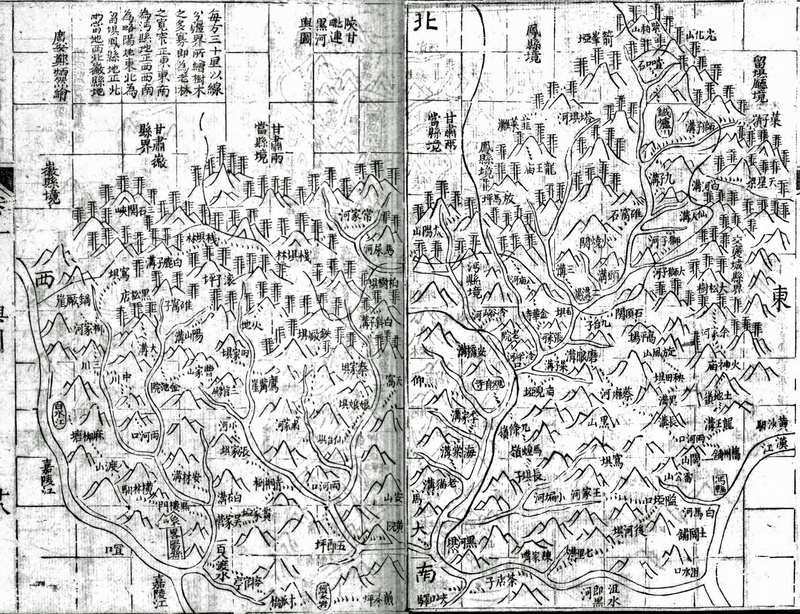 Yan Ruyi's “Map of the four provinces in the north bank of the Han River” 《汉江以北四省边舆图》 (1800~1820). is available from the US Library of Congress in highest resolution as JPEG 2000 (jp2) format. Since not all software can handle this format a set of Jpeg images with sizes of about 2 MB have been made available here. The map was first converted from JPEG 2000 (jp2) to Tiff (tif) without loss and then cut into four quarters. The quarters were converted to JPEG by Adobe Photoshop with enhancement. They can now be viewed across the web without special software. If care is taken, a Jpeg is sufficient in this case to see characters almost as easily as on the highest resolution image. In addition to the Jpeg images, a Google Earth presentation of the LoC Map is available below if you wish to download it and view it in Google Earth. It was scaled as well as possible to modern maps based on assuming a transverse mercator projection with local origin and presented in geographic projection in Google Earth. By zooming in all characters can be read clearly. The accuracy and scaling of this and other maps is a subject currently under investigation and documentation. Lin Tianren (Ed) (2012). 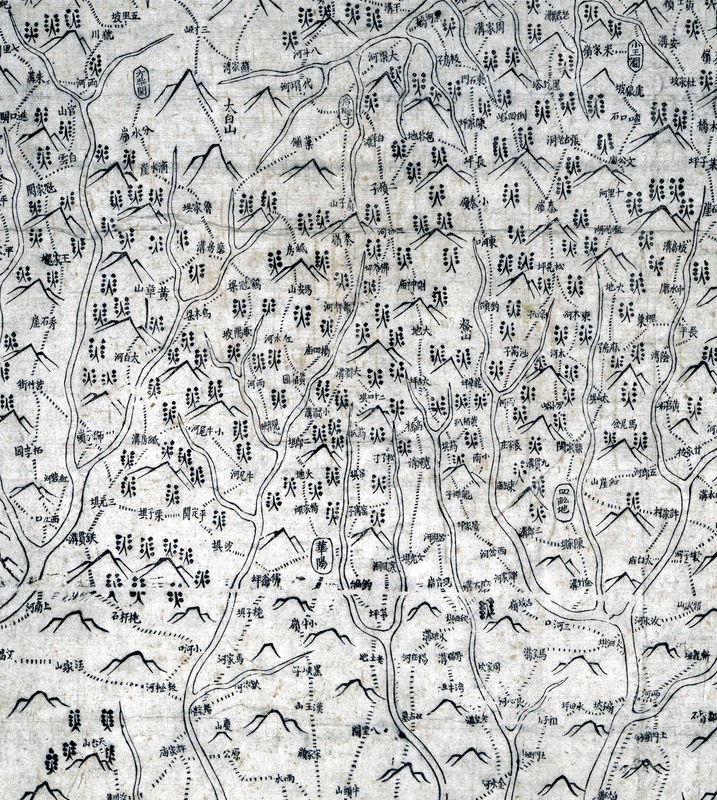 "Mapping the Imperial realm: an exhibition of historical maps", National Palace Museum, Taipei. Meiguo Guohui Tushuguan Guancang Zhongwen Gu Ditu Xulu, Li Xiaocong bianzhu, Beijing Wenwu Chubanshe, 2004-10. A 107 x 182 cm wood block print from the Qing Jiaqing period compiled by Yan Ruyi (Editor) and Zheng Bingran (Cartographer). The map scale is not stated. A red signature block and Title in black ink can be found on the back. The scope of the map covers the Han River from its source and upper reaches downstream to Baihe Xian. To the north of the Han River it includes adjacent [watershed] areas from the four provinces of Gansu, Shaanxi, Henan and Hubei. The brushwork depicts mountains, rivers and administrative units as well as roads and tracks of the Han River watershed. 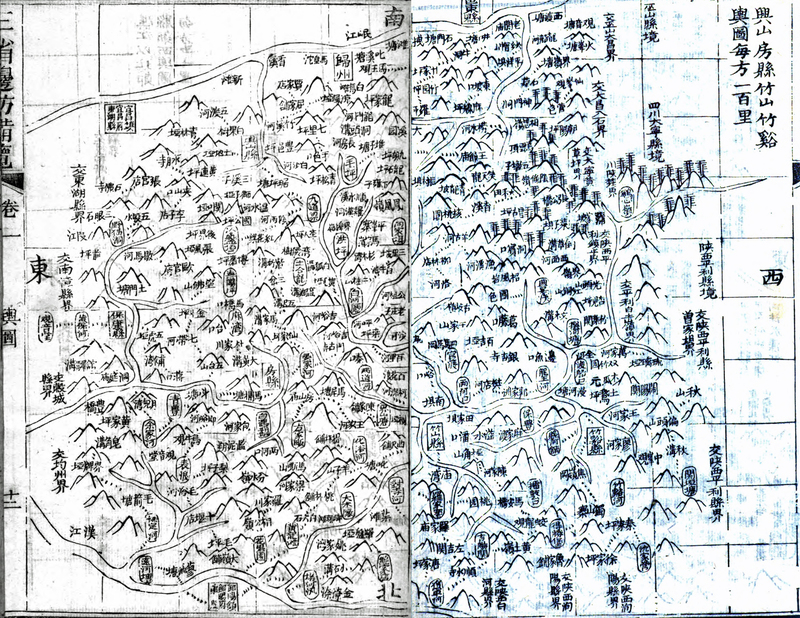 It uses various combinations of vertical and horizontal rectangles, squares, circles and ellipses to distinguish Prefectures, second level Ting, Zhou and Xian counties and military garrisons; it uses dotted lines to indicate roads and tracks, and provides characters to indicate villages and towns, strategic passes and post stations along the roads; it uses triangular symbols to indicate landforms and red lines to indicate the boundaries with the four provinces; in mountain areas it uses symbols to indicate the presence of forests and tree density. It has 6 separate annotation boxes. These provide: the legend for the annotations and symbols, the sources and hydrology of the Han River, the main topographic features, the produce, land reclamation, forestry, roads and situation of the settlers in the mountain areas bordering the four provinces. Ningshaan Ting is present on the map and was established in the 5th Jiaqing year (1800) but Foping Ting [established in 1825] is not present, and the name of Ningshaan does not indicate that the prohibition on writing "Ning" [see Note below] was yet in force. It is therefore likely that the map was compiled in the years between 1800 and 1820. 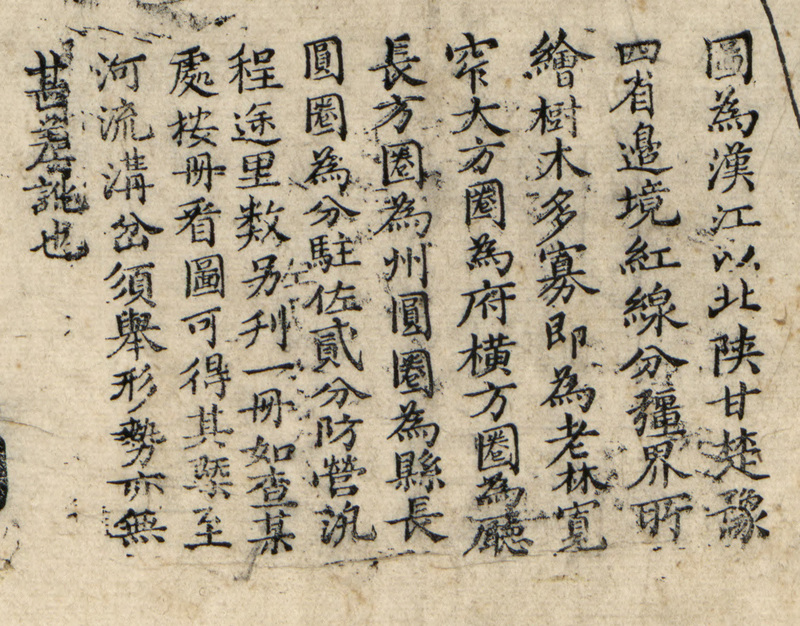 From the annotation, it seems that this collection of materials should be combined with a matching "Map of the Four Provinces on the South Bank of the Han River", but a second such map in the Library [of Congress] collection was not found. 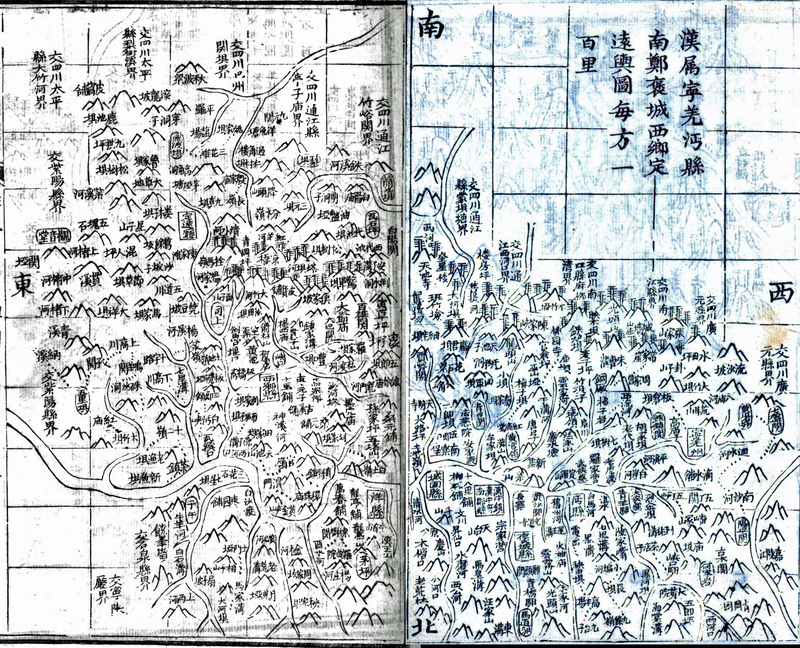 "Map of the Four Provinces on the North Bank of the Han River"
Details for the "Map of regions of four provinces adjacent to the Han River": A map of National importance showing areas from the two banks of the Wei River in the north, the Han River in the south, the Jialing River in the west and a line including Laohe Kou in Hubei, Wenxiang Xian in Henan and Xichuan in the East: the scope includes the upper and lower reaches of the Han River from its source down to Baihe Xian, the administrative areas involved are on the north bank and include the common border areas of Gansu, Shaanxi, Henan and Hubei. On the map the north marker is at the top and the south marker is at the bottom, the drawn area depicts mountain ranges and watershed areas within the common border areas of the 4 provinces, as well as administrative divisions and roads. 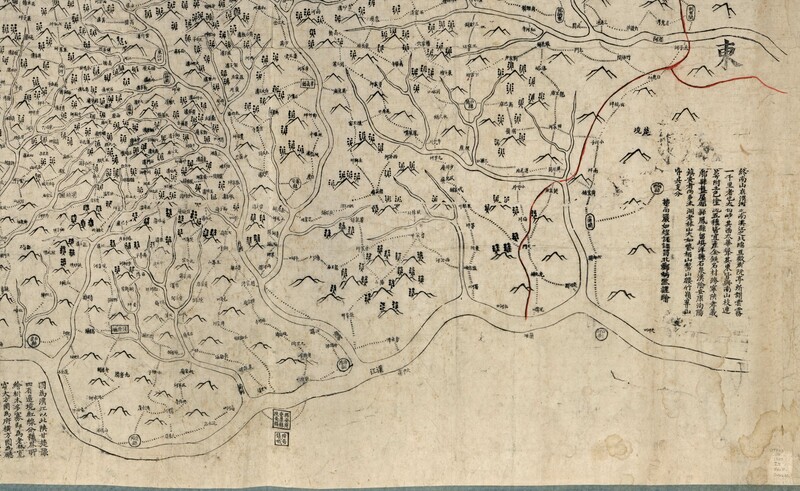 Within the map there are illustrated annotations that explain information in the map legend: "In this map the boundaries of the four northern provinces of Shaanxi (陕), Gansu (甘), Hubei (楚) and Henan (豫) are shown by a red line. Where there are a number of trees drawn, it indicates the extent of native forests; a large solid square represents a Fu, a horizontal rectangle a Ting, a vertical rectangle a Zhou, a circle a Xian and a vertical oval indicates the presence of a Deputy Magistrate or a garrison (usually an 8 level deputy magistrate or a 9 level Zhubu). In regard to the river valleys and gulley branches, if you can identify associated terrain features, there will not be a large error." The roads are indicated by dotted lines, and annotations along the roads indicate Villages and Towns, mountain passes and postal relay stations. Mountain ranges are depicted using triangular symbols, parts of the mountain areas are covered by tree symbols with the number showing tree density: The boundaries of the four provinces are indicated by red lines, and the map has overall six annotation boxes, describing the map production and legend, the watershed of the Han River including its source and hydrology, as well as the terrain characteristics, produce, cultivation in forests, roads and the situation of refugees. This map is due to Yan Ruyi (1759-1826) and Zheng Bingran. 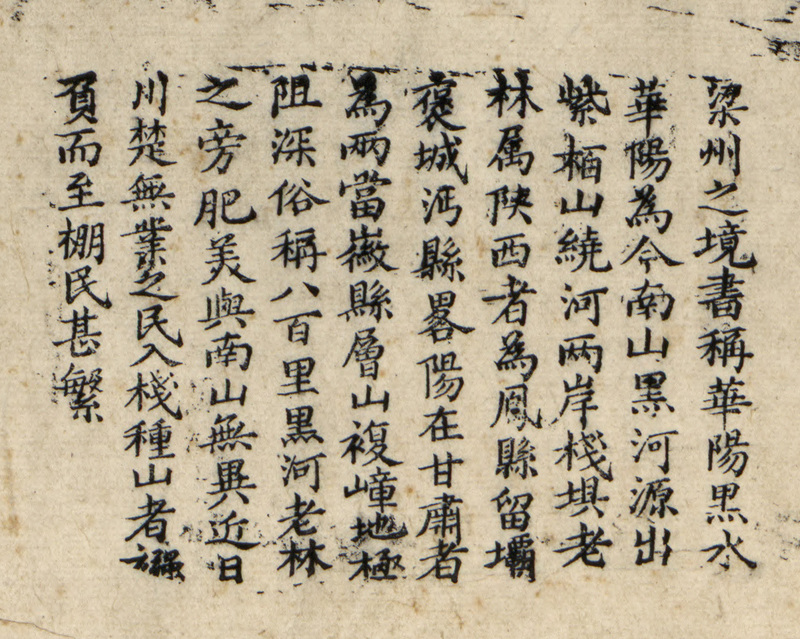 In the first Daoguang year (1821), Yan Ruyi was promoted to Circuit Inspector (Daoyin) of Shaan'an Circuit; Imperial Censor Zhuo Bingtian (1782-1855) compiled the "Current situation in Shaanxi, Sichuan and Hubei" where he wrote: "the region from Lüeyang as far east as Yunxi in Hubei is known as the North Mountains (Qinling) Old Forests"; from the Sichuan border to Baokang in Hubei is known as the "Ba Mountains Old Forests". These areas are not suitable for cultivation and there is very little to gain from them. Drifting people pay landlords a small amount of money to rent a few gulleys and ridges. If harvests are poor they move on, such people are called "Shanty Dwellers". ........... rather than trying to control them in these places, it would be better if they were managed collectively by the three provinces. You are asked to implement this and establish an administration with a high official. " 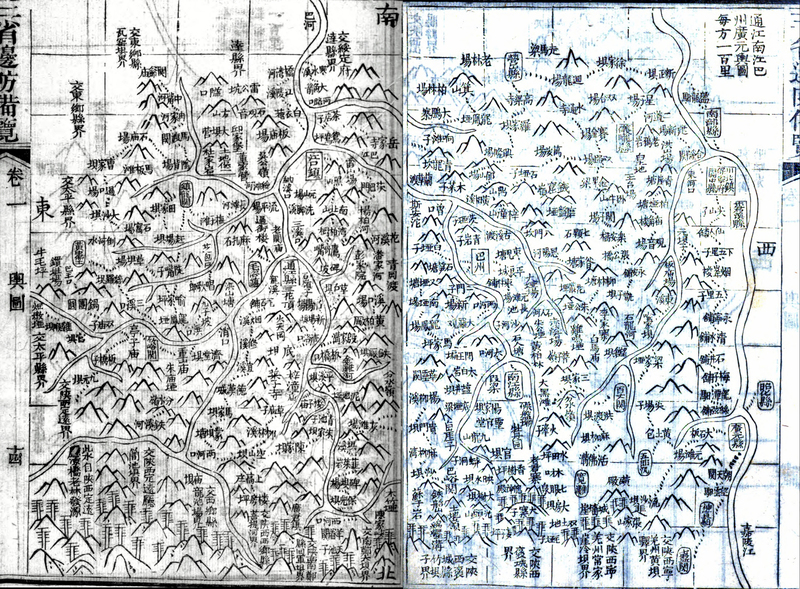 (see "Outline of Qing History" "Annals of Zhuo Bingtian") In the same year, a group led by Yan Ruyi took responsibility for the border region defence in the mountain areas of Sichuan, Hubei and Shaanxi to survey the region and plan for its defence; Yan Ruyi was responsible to investigate the whole region, its government, its garrisons and infrastructure. In the 4th Daoguang year (1824) Yan Ruyi suggested that a Ting administration (namely Foping Ting) be established in Zhouzhi Xian, and modified the borders of Yang Xian and garrisons in Shang Zhou and Lüeyang with the approval of Circuit Inspector Lu Kun (1771-1835) (see "Annals of Yan Ruyi"); but in this map the Ting is not to be seen, nor are the garrisons at lüeyang and Shang Zhou. 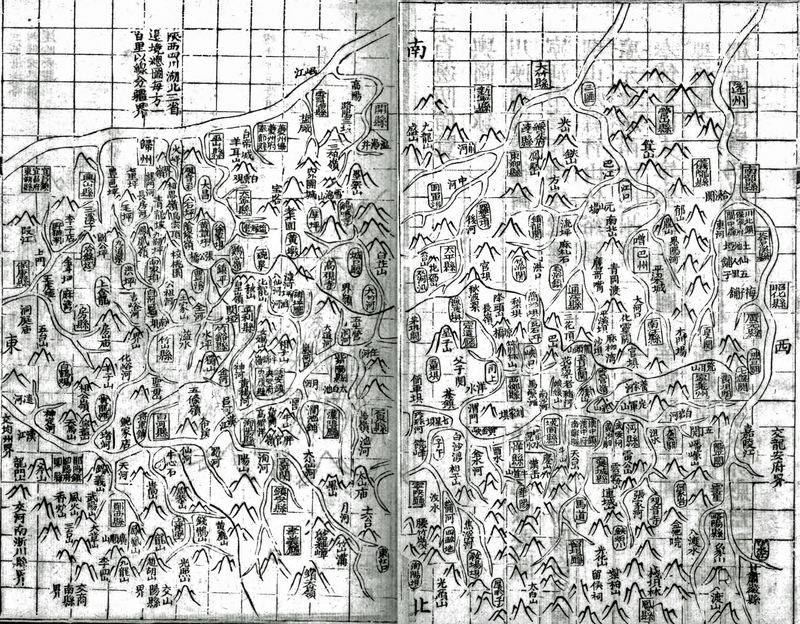 Yan Ruyi had by this time drawn the "Map of three provinces to the south of the Han River" (see Collection of the Taipei Palace Museum, item number 021473), which can be consulted for reference; in this map can be found Dingyuan Ting which had been established in the 7th Jiaqing year (1802) (see Yan Ruyi (Ed) "The Hanzhong 1813 Gazetteer" [V.2 "Constructions"]); new administrations can also be found in the three counties of Ankang, Ziyang and Pingli which were in place by the 3rd Daoguang year (1823) but Foping Ting was not yet established. The two maps seem to have been constructed at the same time, and the information in the two maps can be corroborated. 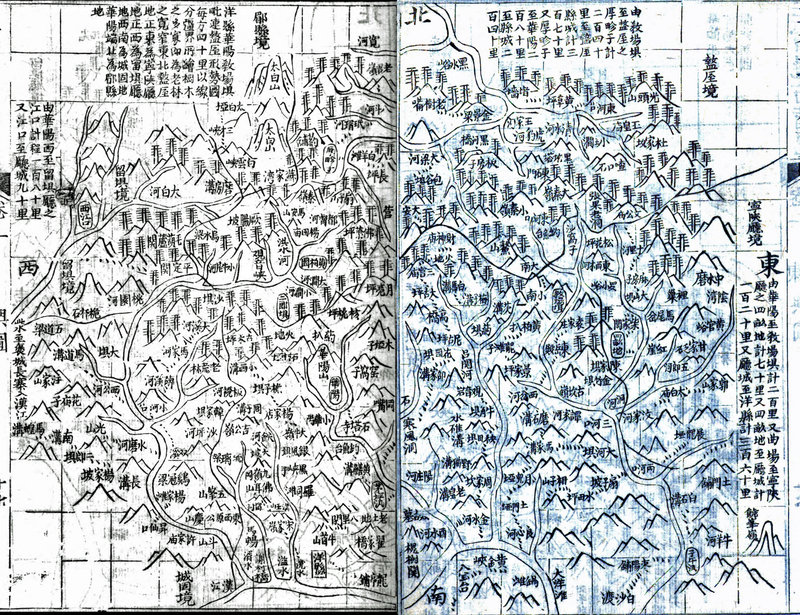 It seems that the two maps had been drawn by Yan Ruyi by the 2nd Daoguang Year (1822) at the time that the "Complete overview of defence conditions in three provinces" was published. By contrast, Beijing Library (National Library) judged only that the maps were drawn between the 5th Jiaqing year (1800) and the first Daoguang year (1821), which needs to be refined further. 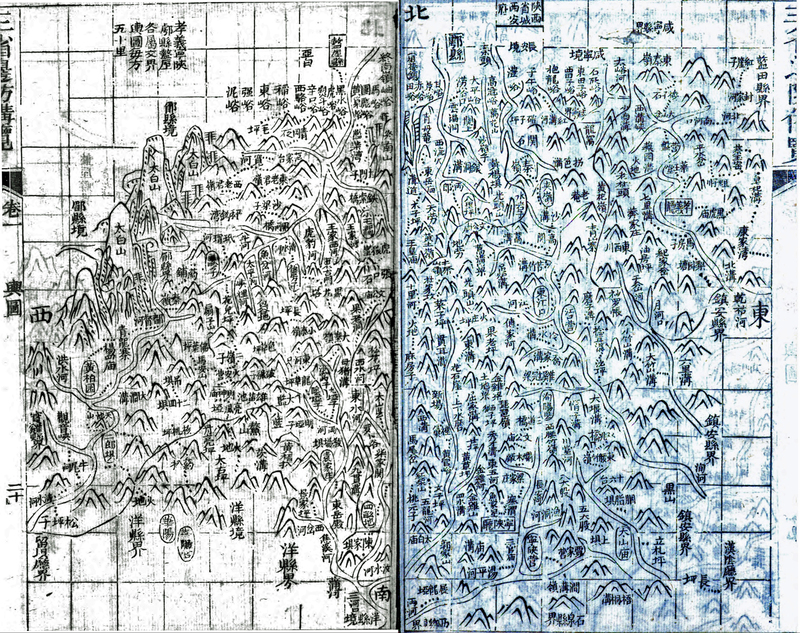 Director Feng Suiping of the Hanzhong City Museum has written two papers on the maps that have been translated and made available on this page. The first was (in fact) written after a draft of the second was under discussion. It is clear from the above descriptions of the LoC Map that there are diverse suggestions as to the timing. 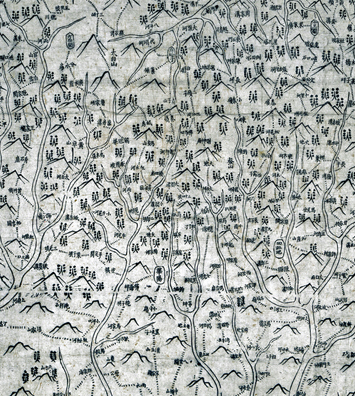 The work by Prof Lin Tianren and the existence of the two maps in the Tapei Palace Museum collection have only become recently well advertised. However, from a number of differences described by Feng Suiping in the first Paper, it seems Prof Lin's comments were based on assuming the LoC Map and the Taipei Map were the same which is not the case. Feng Suiping's arguments suggest strongly that the LoC Map is from an earlier activity and that the Taipei Maps are copies of the earlier maps with some additions as well as some errors. 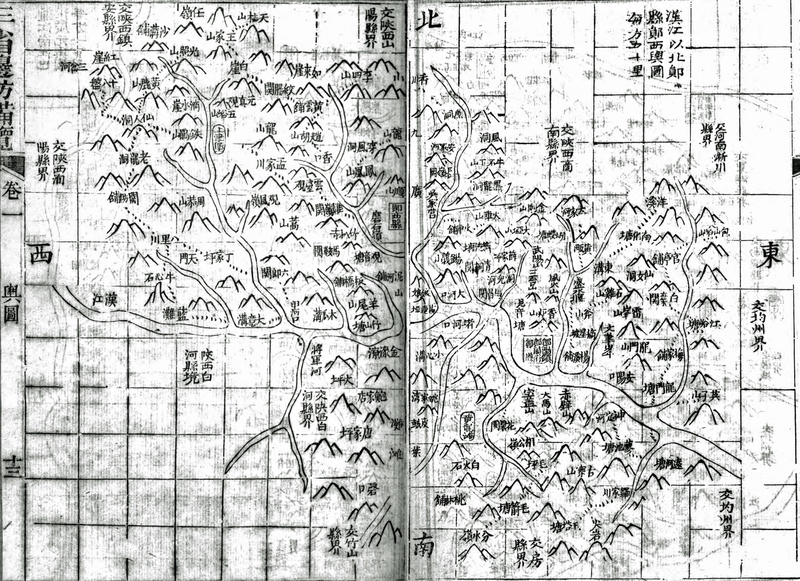 It is likely the Taipei Maps were produced as part of the effort leading to the 1822 “Complete overview of defence conditions in three provinces” (Yan Ruyi, 1822), that it was commissioned by the Military Governor of Hubei Yan Junlie and drawn by a person who is not acknowledged on the map(s). 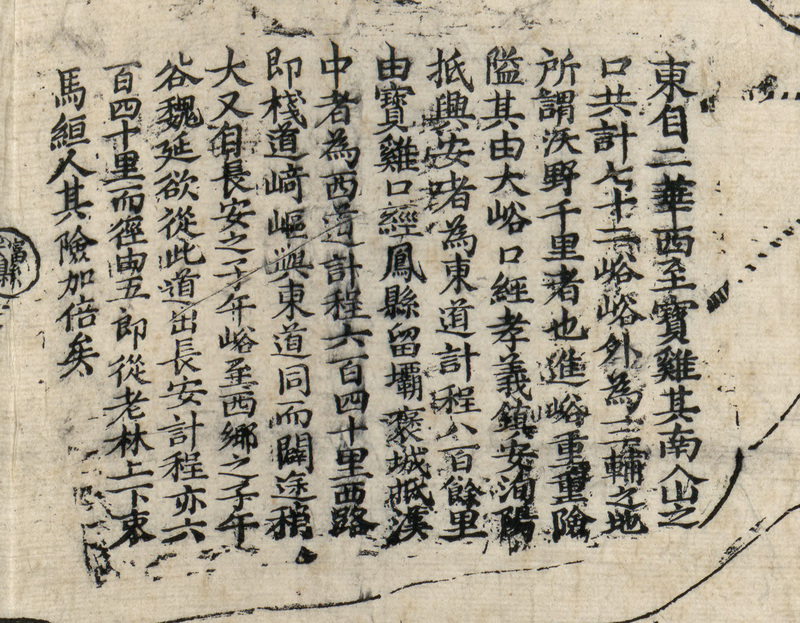 The document includes both a Translation into English and the complete Chinese text for comparison and discussion and can be read or downloaded HERE. 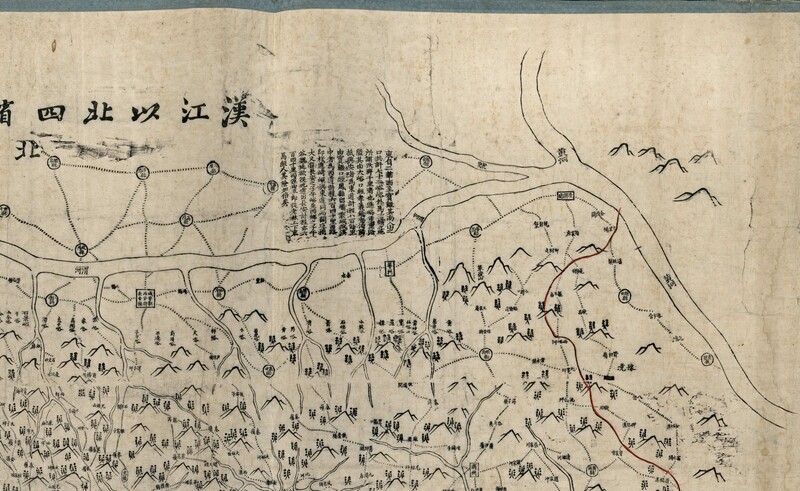 Feng Suiping's second and more extensive paper is called “Postscript to the “Map of neighbouring regions of four provinces on the north bank of the Han River” from the collection of the US Library of Congress.” It discusses the map held by the LoC in close detail and proposes likely dates for its development and printing. 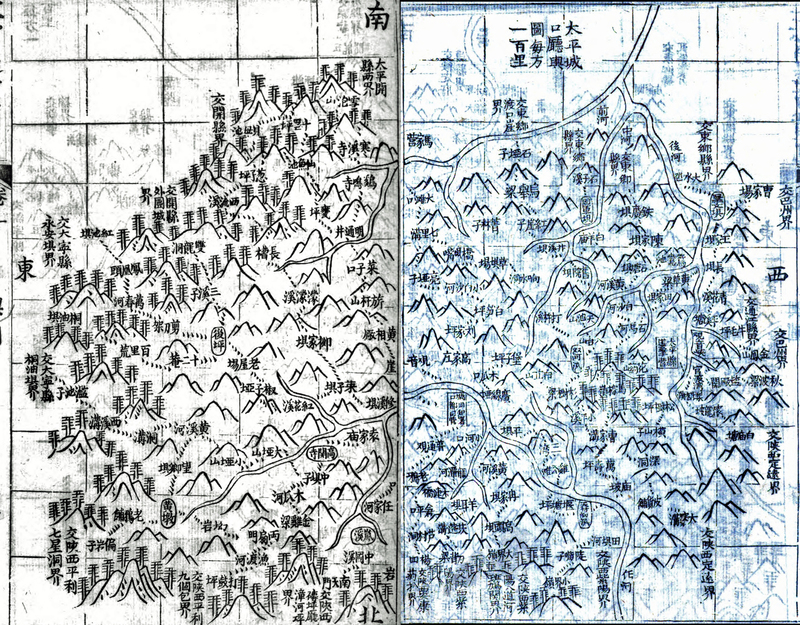 The proposals are earlier that those of Prof. Lin Tianren but based on the ideas discussed in the first paper (see above) sees the LoC Map as a product of an original mapping effort (1808-1813) that was later copied and re-drawn as the maps (north and south of the river) in the Taipei Palace Museum. The English language paper available here is a translation of the Chinese language paper 《美国国会图书馆藏《汉江以北四省边舆图》书后》. 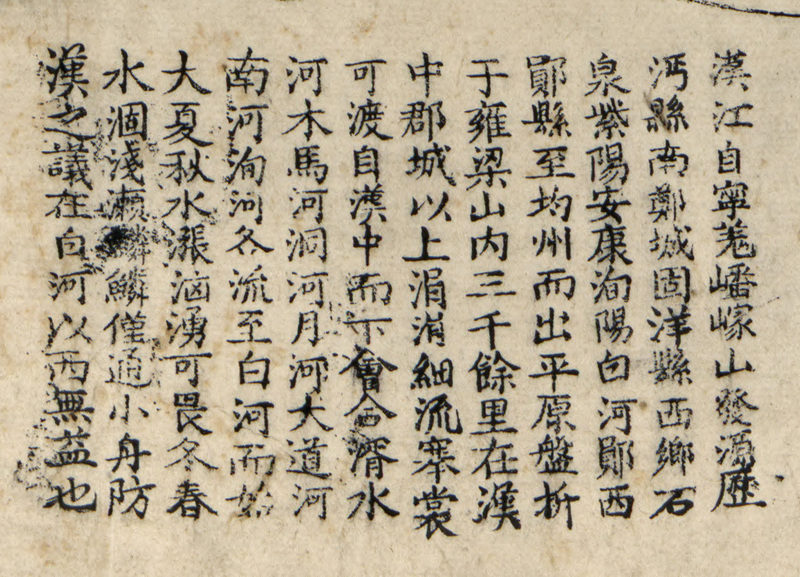 This paper was originally written prior to locating the maps in the Taiwan collection and has been revised to take these maps into account. 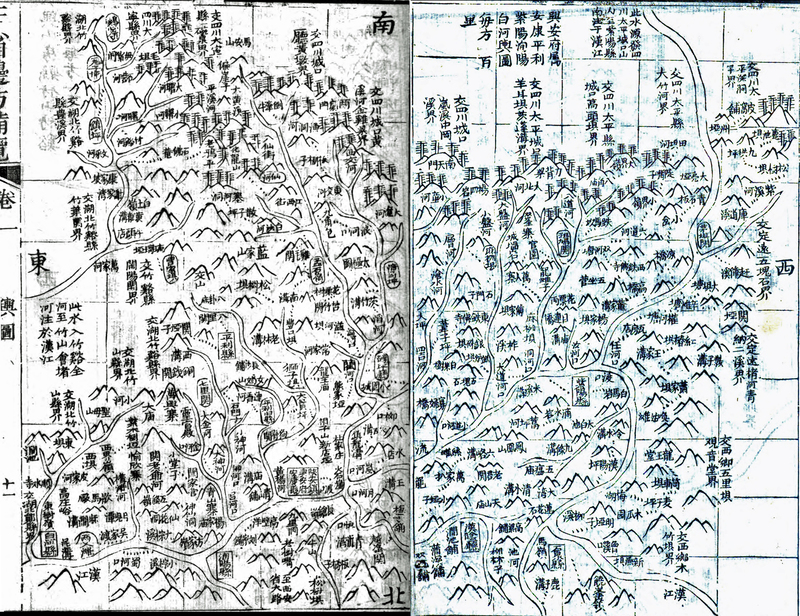 The paper builds on the studies and suggestions by Prof Li Xiaocong and Prof Lin Tianren and undertakes a detailed examination of the map annotations, the 72 Valley Entrances on the north of Qinling as well as the geographical and cartographic principles used in construction the map. 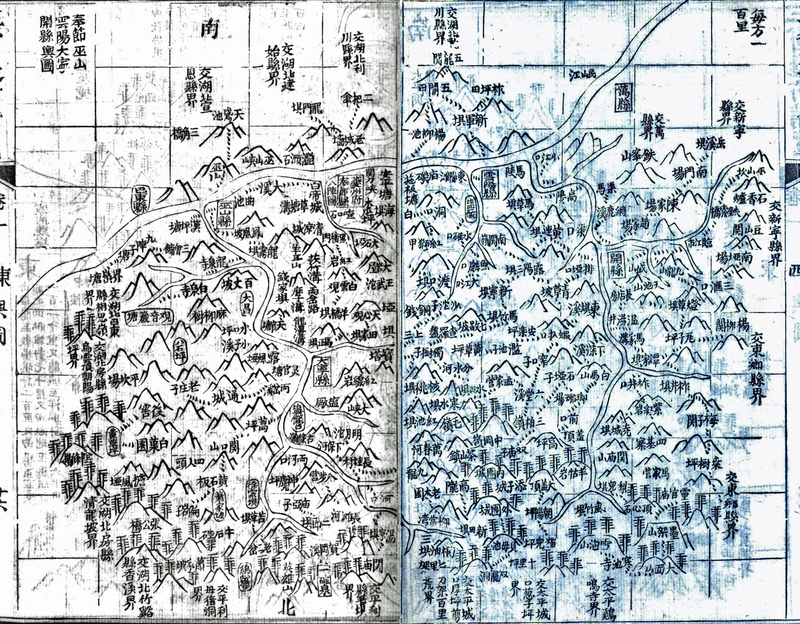 The paper proposes the original map was drafted and published between 1808 and 1813 while Yan Ruyi was Prefect of Hanzhong but most likely had some additions in the one or two years following that period as mapping continued. The English translation has added some Figures and explanations in footnotes. A separate document on Chinese mapping technology as demonstrated by Yan Ruyi and others over this period is in preparation. The image tables provided after the summary of the paper have been collated as a resource for closer study of the ideas raised here by Feng Suiping and in the books by Prof Li Xiaocong and Prof Lin Tianren. Summary: The “Map of neighbouring regions of four provinces on the north bank of the Han River” is a Qing Period map of the Qinling region in the US Library of Congress collection which is of the utmost importance. This paper introduces and discusses the annotations and legend from a geographic point of view and establishes where the map’s value lies. On the basis of records from a number of historical documents, it can be established that the drawings were the achievements of one Zheng Bingran. On the basis of the suggestion by Lu Yinpu to "provide a scale using the method of squares" the time when the map was drafted is suggested to be between September of the 13th Jiaqing year (1808) and September of the 18th Jiaqing year (1813). Progress is also made in regard to the existence of the parallel publications “Map of three provinces on the south bank of the Han River” and “Records of roads in the mountain regions of three provinces”. The Jpeg maps available in the table below were developed from the original JPEG 2000 image which was divided into four quarters to keep the Jpeg sizes of sub-images acceptable for download (max of 2 MB). The set of six (6) annotations are also provided as details for close examination of the characters. NOTE 1 : The images have been tested for view in Windows Explorer browser. However, despite reduction of size achieved, it is possible that the large images may not open in your browser. If this happens, you can download a image to your computer by "right clicking" on the link and using the “Save Target As…” option rather than opening it in the browser or picture viewer. NOTE 2 : If you wish to view the Jpeg image of the whole map, rather than the four quarters, it is 7.8 MB and so it has been put into a "Zip" file to force download rather than view in the browser. It will be able to be viewed by many image view software packages. To download it hit HERE. NOTE 3 : Alternatively, the map can be downloaded as a super-overlay for viewing in Google Earth. If you zoom in to the image then all characters can be read as well. This presentation has been shifted and scaled in the north-south and east-west directions to align it as closely as possible with the earth's surface. It is quite a good match overall but retains significant distortions - as you would expect. You are welcome to download the KMZ file from HERE. If you would first like to read an introduction to the materials available as KMZ a PDF can be accessed HERE. In the "Complete overview of defence conditions in three provinces", Yan Ruyi provided 14 maps with scale bars and consistent symbols for places in the Districts involved in the span of the study. Map 2 is a strip map of considerable length and is not included but the others are each on two facing pages and cover a specific region. The maps have been merged so that the two facing pages are joined to make a map mosaic. They are accessible through the following Table where the map name in Chinese and English is provided as well as the scale (length of the square grid cell side in Li) and extent (dimensions of the map in squares) of the map area. In the text of the "Three Provinces Defence", the road distances and travel times are discussed as well as strategic issues of the border regions. They represents the culmination of the work done by Yan Ruyi since 1808 when he went to Hanzhong Fu. The maps are accessed through the Map Number. A KMZ file is available for viewing the geographic extent of the Maps in Google Earth, but not the individual maps which can only be accessed in the Table. If you use Google Earth and wish to try this KMZ file it can be accessed HERE. If you would first like to read an introduction to the materials available as KMZ for the maps on this page a PDF can be accessed HERE. NOTE 1 : A mosiac of Four 1:500k scale Russian Topographic Maps has been created at 25m resolution cell size that covers much of this region. It can be used especially to identify terrain features and rivers as well as places if the Cyrillic is converted to Pinyin as described in documents available at the Qinling Plank Roads to Shu web site. The KMZ file provides access to a super-overlay of this map mosaic in a zip file that also includes the two other KMZ files referenced above. To download it you can click HERE. If you would first like to read an introduction to the materials available, a PDF can be accessed HERE. 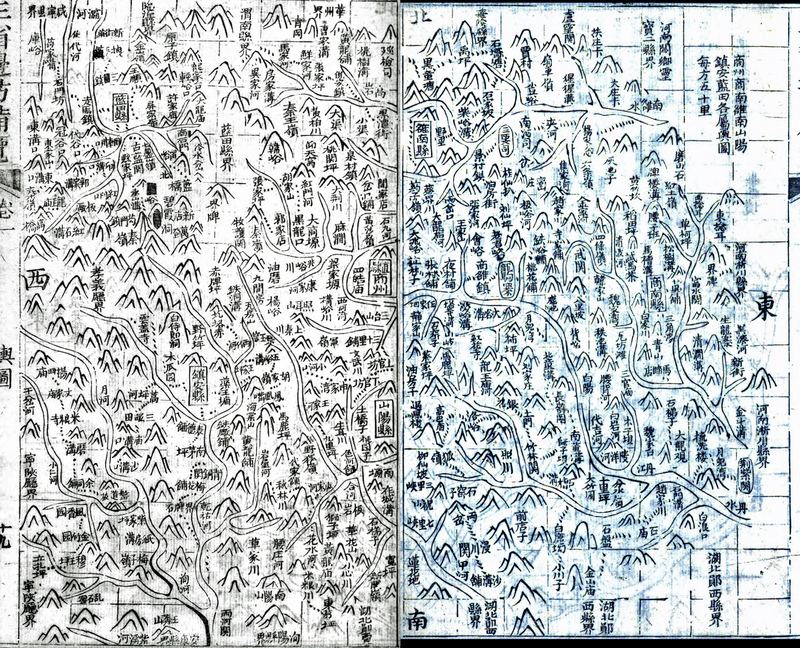 NOTE 2 : The Map 1 Overview Map of the collection from this book (川陕湖边境总图) can be viewed in Google Earth as it has been scaled to geographical projection and located for this purpose. In the book it has North at the top and East to the left and so presents rotated by 180 degrees here. It is not very accurate by modern map standards but it scales surprisingly well for a Qing Period map. As printed in the book scanned (25cm height by 30cm width for the pair of facing pages) it is nominally 1:1.5M scale. Its scaling is part of a study on the scaling and metric properties of all the maps between 1808 and 1822. It has been made into a KMZ file and a KMZ file of the control places used to scale the map is also available. You are welcome to download the two KMZ files in the Zip file provided HERE. If you would first like to read an introduction to the materials available as KMZ a PDF can be accessed HERE. (1) Investigations have been made to relate the annotation on the "72 Qinling Valley Entrances" to known valleys. This has resulted in a Google Earth presentation and a supporting document. The supporting document can be accessed HERE and the Google Earth presentation downloaded HERE This material will be updated (if possible) with field work.